Here are seven Bible verses that describe the beauty that is found only in God. The psalmist, like Christians today, cannot wait for the great day when Jesus returns and takes command of the kingdoms of this world and they become part of the kingdom of God. To those who have trusted in Christ, He is most beautiful, not only in essence but in quality and attributes. Beauty is not restricted to what we see but is more of what a person does and what more could Jesus do than to die for His enemies and the wicked sinner (Rom 5:8, 10)? What is a more beautiful thing than to die for someone who was an enemy and yet Jesus said “Greater love has no one than this, that someone lay down his life for his friends” (John 15:13) and amazingly He says, “You are my friends if you do what I command you” (John 15:14). If you had a friend and he or she promised to do something for you but then didn’t do it, could you say that they really love you like a close friend should? No, as Jesus said, “If anyone loves me, he will keep my word, and my Father will love him, and we will come to him and make our home with him” (John 14:23). Again, for those who trust in God, they will behold the King that is most glorious and most beautiful but it’s not so much the appearance of beauty on the outside but the beauty of the work of the Person of Christ. We shall see Him someday, as it were, face to face (Rev 21:3; 22:4) and He will be with us and we will see Him and He will be our God, forever more. Isn’t that a beautiful thought? This one describes Zion, the City of God, as beautiful but this glimpse of beauty is yet in the future, when the kingdoms of the earth will become the kingdoms of our Lord, Jesus Christ. His glorious splendor cannot even be described but the glory of God, in all His majestic beauty, will surely shine forth someday for all who trust in Him to behold. Since God doesn’t look at the outward appearance but at the heart (1 Sam 16:7), what He sees in the heart can either be ugly or beautiful and a beautiful spirit is one which is humble, contrite, and willing to live a life of service and love for others. There is also beauty in the creation and it reflects the beauty of its Creator God Who created a perfect world but was quickly populated by imperfect human beings. Only when a person trusts in Christ does God see anything beautiful in us but it’s not really our beauty but the very righteousness of Christ that God sees (2 Cor 5:21). Isaiah the Prophet is writing about a future time that is yet to unfold on the stage of human history and when it does, everything will be new! All of the sorrow, pain, suffering, and even death will vanish for all time and that is a beautiful thought, is it not? Later, Isaiah wrote of Jesus, “For he grew up before him like a young plant, and like a root out of dry ground; he had no form or majesty that we should look at him, and no beauty that we should desire him” (Isaiah 53:2). This prophecy of Isaiah describes a young Jesus Christ who grew up in a place that was a spiritual wilderness and out of a dry ground came the water of life, the living water, Jesus Christ. Jesus, like John the Baptist, was crying out in the wilderness, again, a spiritual wilderness but Jesus promises “If anyone thirsts, let him come to me and drink. Whoever believes in me, as the Scripture has said, ‘Out of his heart will flow rivers of living water’” (John 7:37b-38). 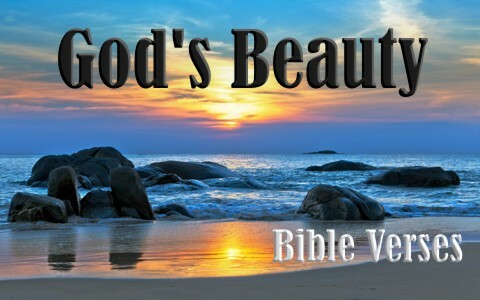 Whatever you look like, beauty has nothing to do with the outward appearance at all (1 Sam 16:7) but as Peter writes to the Christian woman, “let your adorning be the hidden person of the heart with the imperishable beauty of a gentle and quiet spirit, which in God’s sight is very precious” (1 Pet 3:4). That is true beauty to God. It’s not what you or I look like on the outside, but what’s in our heart and if a person has repented and trusted in Christ, then that is a beautiful thing. Dear Pastor, the interpretations of the Bible verses in this article are not right. God is the Father, Creator of Heaven and Earth and the maker of you and me and Jesus is His Son. The verses that refer to God, our beloved Abba are about Him only. Its not about Jesus. The spirit of God resides in Jesus, that makes them One yet distinct in nature when Jesus tells his disciples, why do you call me good, only God is good. No, Jesus is called Creator and in the context of the creation, it is said that by Him (Jesus, John 1) all thing that exist were made for Him. Jesus is God and the Spirit is the Holy Spirit and then there is God the Father. Please know that you don’t know Jesus as God and He said that “this is eternal life, that they know you, the only true God, and Jesus Christ whom you have sent” (John 17:3), so if you don’t know the right Jesus and God the Father, then you do not have eternal life. If you get the wrong Jesus (i.e. as not god but became God) then you don’t have the right Savior! Warning. Please acknowledge that Jesus is God and this is evident in the gospel. Please, for your eternal soul’s sake, find out that Jesus is God and that can be discovered in God’s Word! Jesus is both God and Man, so if you leave the “God” out of Jesus and that He became God, you’ve got the wrong Jesus! The reference to only God is good is because the young rich man didn’t know Jesus yet and that He was God! Please study your Bible and the gospels. Previous post: What Is Spiritual Blindness? Next post: How Do You Know They Are Christian?